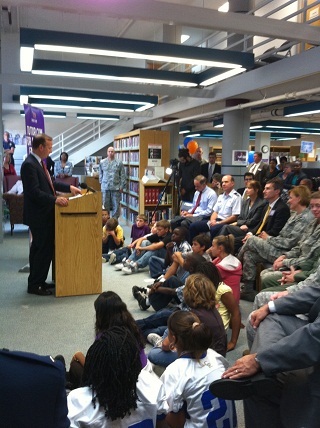 Governor Markell addresses students, parents and military leadership at Dover Air Force Base. NEW YORK - October 28, 2010 - Governor Jack Markell and U.S. Senator Tom Carper (D-Del.) joined Colonel Manson Morris, Commander, 436th Airlift Wing, Dover Air Force Base and George Cigale, founder and CEO of Tutor.com to help launch the Department of Defense’s (DoD) Online Tutoring Program—Tutor.com for U.S. Military Families—today at the Base Library. The online tutoring and homework help program is funded by the DoD and available 24/7 to all eligible military members and their families in the Air Force, Army, Marines and Navy around the world for free. Governor Markell and Senator Carper are both committed to strengthening schools and providing Delaware students with a 21st Century education, especially as one of the first states to be awarded a prestigious Race to the Top grant from the federal government. The Governor, Senator and Colonel addressed a room full of local military students and their parents, as well as service members, and encouraged them to use this new education service to complete their homework assignments, build their confidence and improve their grades. "Our brave men and women in the military have stepped up to serve our nation and it is encouraging to see people stepping up to do something good for their children," Governor Jack Markell said. "These parents are away fighting to protect their country and their children's futures. This online and on-demand tutoring program for homework and school work will help those children graduate ready to succeed." The program was officially announced by the Department of Defense earlier this year and since then tens of thousands of military students and service members have connected to a professional online tutor to receive live help to complete homework assignments, study for exams, work on math, science and writing skills and much more. Help is available to kindergarten through college students in all core academic subjects including math, science, social studies and English. Tutor.com is the world’s largest online tutoring service. The Tutor.com network of over two thousand professional tutors and career specialists have delivered almost 6 million one-to-one tutoring and career sessions in a proprietary online classroom optimized for learning, since 2001. Tutor.com powers tutoring and homework help programs for the Department of Defense; the states of Alabama, Alaska, Kansas, Louisiana and Rhode Island; the District of Columbia, and thousands of public libraries and K-12 schools. For more information about Tutor.com for U.S. Military Families please go to www.tutor.com/military.